Brooklyn Digest: Books: Take A Trip to Renaissance Italy With "The Chef's Secret"
Books: Take A Trip to Renaissance Italy With "The Chef's Secret"
Crystal King has created a mouthwatering drama that combines the little known facts about Scappi's life with hints of passion, dashes of betrayal, and a few drops of poison. Giovanni is so compelled to learn his uncle's secrets that he ignores his uncle's dire warning that the information concealed in these boxes could put the lives of several individuals at risk. He undertakes the arduous task of decoding Scappi's journals and uncovers a history of deception, betrayal, and murder, all in order to protect an illicit love affair with a noblewoman his uncle gave the codename "Stella." As Giovanni pieces together the narrative of Scappi's sordid past, he risk losing all that he holds dear. It is a story of hidden love, deadly secrets, and family bonds, bringing Renaissance Italy to life in a delectable way. King writes of when Giovanni found out Scappi passed away, "Word traveled fast at the Vatican, even during the darkness of night. Within an hour of Bartolomeo Scappi's passing, serving women from all over the palazzo had come to the chef's bedside, crying for the man they had loved and respected. They keened and wept, tearing at their hair, their skin, and clothing, their wails filling the gilded halls. Francesco Reinoso, the Vatican scalco, ordered the staff to bring candles, and soon they filled the room with their glow, lighting up the shadows and illuminating the faces of the mourners. As papal steward, Francesco always kept things in order, even when his best friend was before him on the bier. "I sat in the corner and watched, lost and helpless, as two of the kitchen servants helped my mother, Caterina, and her maid bathe and dress my late uncle Bartolomeo. Of course, these women needed not take on this macabre task - the servants who reported to Francesco were more than capable, but they insisted, such was their love for my uncle. The heavy odor of rosewater hung in the air as they perfumed Bartolomeo's skin. It broke my heart to breathe in the scent. It was a smell he had loved, using the floral essence to flavor thousands of dishes in his kitchen. "For the last eleven of my thirty years, I had worked as an apprentice to Bartolomeo, a lion of a man who spent his days fussing over pots of boiling meats, scribbling elaborate seating arrangements on thin parchment, then directing kitchen servants on which pies to bake and how many ducks to cook. Being related to Bartolomeo Scappi was a great honor. As the celebrated private chef to several popes, he was lauded in circles all over Italy, and countless cardinali, nobles, kings, and queens had fallen under the spell of his cuisine as I had. I always thought him invincible. And he had been, until five days past when sickness broke his spirit and laid him low. During his illness, I eschewed my duties in the kitchen and remained by his side, ever my uncle's braccio destro, his right hand, as he often referred to me. He was more to me than my maestro; he was also the father I never had, my own having died of plague before I was born. To see him stretched out before me, his eyes closed, his skin so pale and cold, seemed inconceivable." King tells the story in chapters focused on different parts of Giovanni and Scappi's lives. The starting point of most chapters is one of Scappi's journal entries, followed by what went on in Scappi's life and, in Giovanni's chapters, what he did with that information. This parallel story-telling gives the book a cinematic feel. 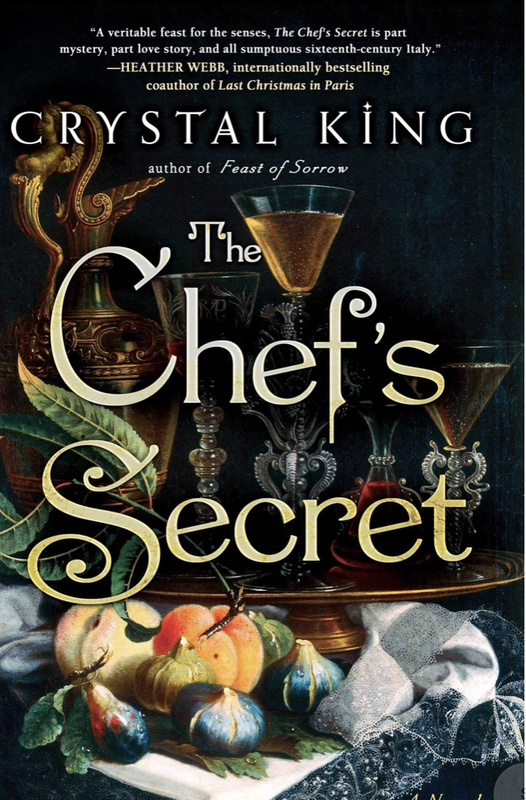 The Chef's Secret is a trip back to one of the most compelling times in history, complete with a story wrapped in a mystery.